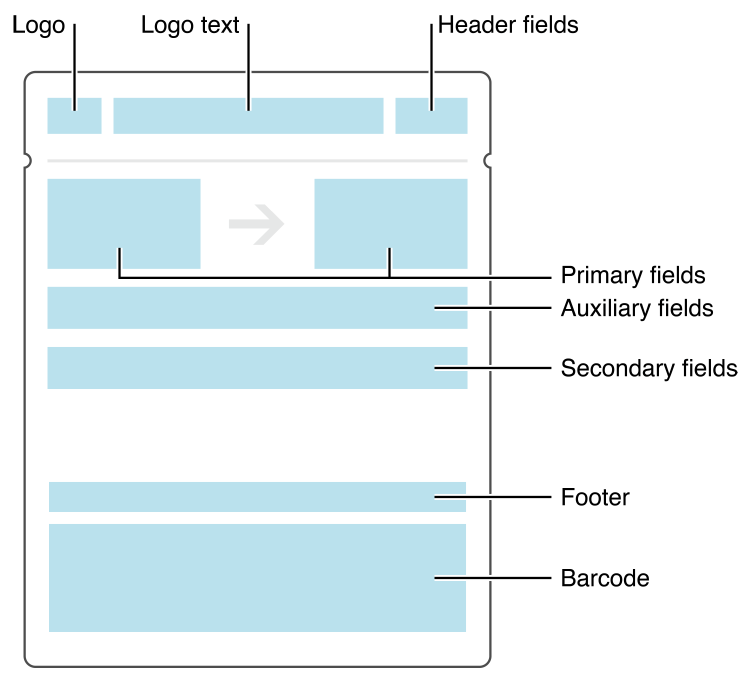 The passes style determines the overall visual appearance of the pass and the template for placement of information on the pass. The most distinctive visual indication of the style is at the top edge of the pass. Event tickets have a small cutout, coupons have a perforated edge, and so on. Passes contain text, images, and a barcode. You set the pass’s style, provide images, and set colors and text formatting. The Wallet app then lays out and presents the pass for you. It also provides controls, letting the user manage and delete passes. background image is displayed behind the entire front of the pass. The expected dimensions are 180 x 220 points. The image is cropped slightly on all sides and blurred. Depending on the image, you can often provide an image at a smaller size and let it be scaled up, because the blur effect hides details. This lets you reduce the file size without a noticeable difference in the pass. 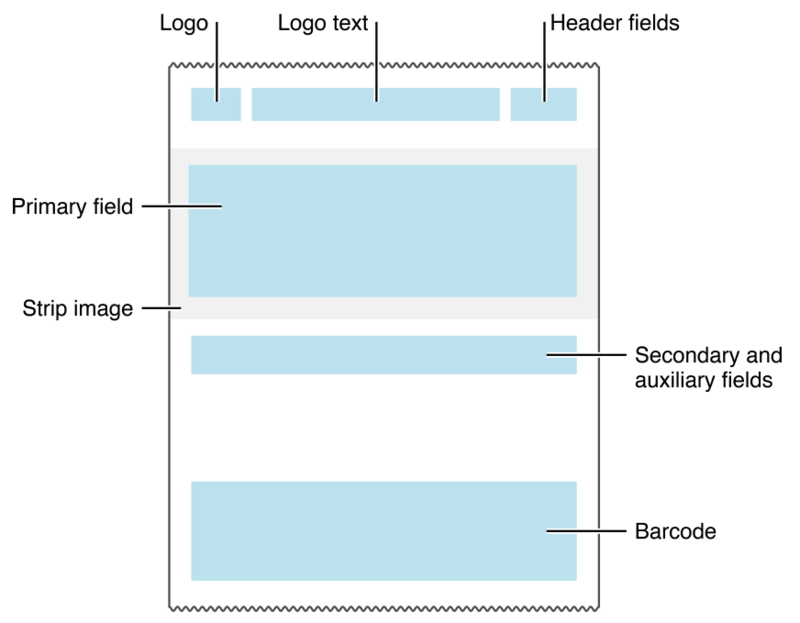 footer image is displayed near the barcode. The allotted space is 286 x 15 points. icon is displayed when a pass is shown on the lock screen and by apps such as Mail when showing a pass attached to an email. The icon should measure 29 x 29 points. logo image is displayed in the top left corner of the pass, next to the logo text. The allotted space is 160 x 50 points; in most cases it should be narrower. strip image is displayed behind the primary fields. On iPhone 6 and 6 Plus The allotted space is 375 x 98 points for event tickets, 375 x 144 points for gift cards and coupons, and 375 x 123 in all other cases. On prior hardware The allotted space is 320 x 84 points for event tickets, 320 x 110 points for other pass styles with a square barcode on devices with 3.5 inch screens, and 320 x 123 in all other cases. thumbnail image displayed next to the fields on the front of the pass. The allotted space is 90 x 90 points. The aspect ratio should be in the range of 2:3 to 3:2, otherwise the image is cropped. 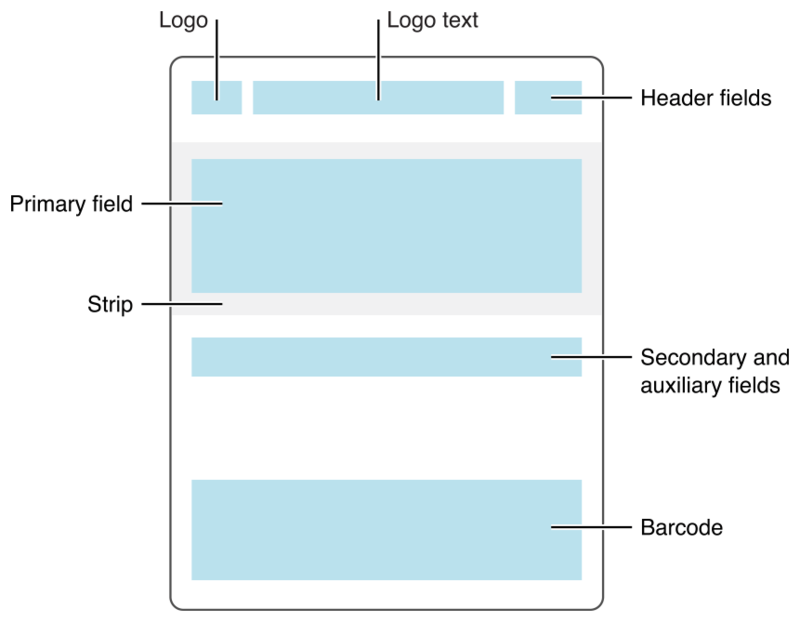 Boarding pass logo, icon, footer See Figure 1. Coupon logo, icon, strip See Figure 2. Event ticket logo, icon, strip, background, thumbnail If you specify a strip image, do not specify a background image or a thumbnail. See Figure 3. Generic logo, icon, thumbnail See Figure 4. Store card logo, icon, strip See Figure 5. 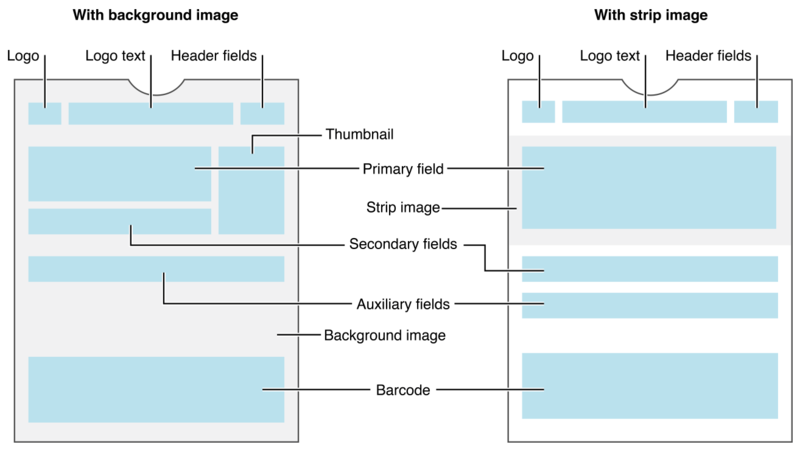 In general, a pass can have up to three header fields, a single primary field, up to four secondary fields, and up to four auxiliary fields. Boarding passes can have up to two primary fields and up to five auxiliary fields. 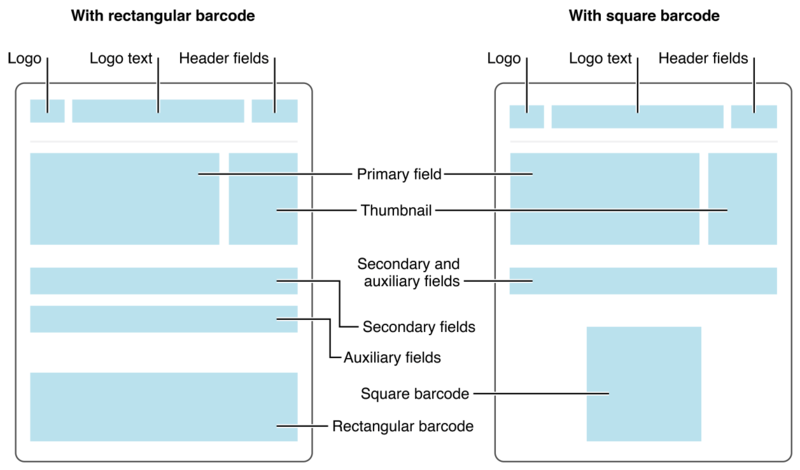 Coupons, store cards, and generic passes with a square barcode can have a total of up to four secondary and auxiliary fields, combined. The number of fields displayed on the pass also depends on the length of the text in each field. If there is too much text, some fields may not be displayed.